Have you struggled with an old, broken-down mower for another whole season? You deserve an upgrade. 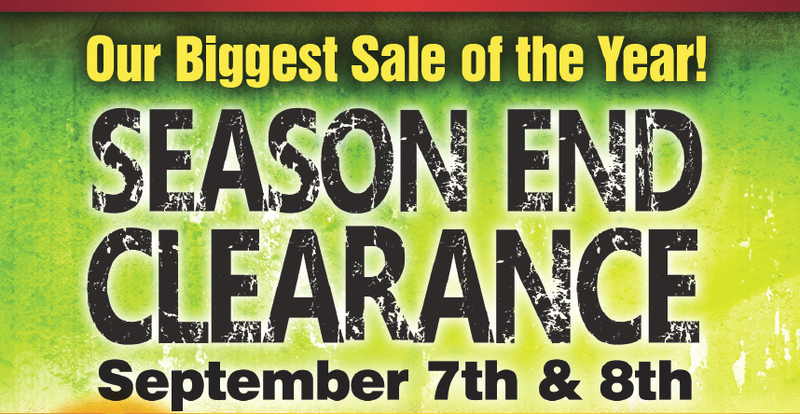 And our End of Season Clearance Sale is your opportunity to get that equipment with unbelievable savings! Every PowerPro location will be joining in on this sales event on September 7th and 8th, so here’s your excuse to check out the deals. Mark your calendar and plan to join us at your closest PowerPro location! Find our lowest prices of the year and take advantage of incredible clearance discounts. We promise you don’t want to miss this sale. Here’s just a little sneak peek at what you can expect to find on sale. Remember that discounts apply to in-stock units only, but we are always happy to help you customize your dream mower! Designed to deliver high-performance, precise cutting, and optimal driving comfort, Hustler’s broad range of zero turn mowers are built to the highest standards, and with the world-famous quality that the Hustler brand has delivered for over 50 years. Get ready to take the hassle out of mowing with Hustler! Have you heard of Spartan Mowers? The brand roared onto the scene in 2015 to bring more power and fun to the mowing experience. Driving a Spartan mower feels like piloting a sports car, and when it comes to durability and performance, these zero turn mowers are second to none. Why just mow your lawn when you can have fun mowing your lawn with Spartan? A classic American brand with an unbelievable number of mower models, from sturdy walk-behinds to zero turn machines with all the innovative features you expect at a variety of price points, Toro makes yard care effortless. Take advantage of blowout pricing on Toro walk-behinds during the sale! With some of the strongest warranties in the industry, Husqvarna lawn mowers are rugged and incredibly durable. Beloved the world over for their high quality as well as their focus on ergonomics for extreme driver comfort, Husqvarna makes worry-free mowers more homeowners and professionals rely on. Find incredible deals on hand-held grounds care equipment, saws, and tree care machinery, too! Want to know if the particular piece of equipment you’ve been dreaming about will be on the sale? Give us a call at 717-354-4241 today. And, don’t forget to save the date for our Mahindra Sales Days Event coming up on September 21st & 22nd! Let us show you why Mahindra is the top-selling tractor in the world!